Whether you yearn for home-grown blueberries on your morning cereal or attracting beautiful birds in your back yard, you'll find success in container-grown blueberries. Have you ever had a cedar waxwing visit your back yard? They are gorgeous birds, but can be difficult to attract to your yard unless you have fruit. In a small back yard, it can be difficult to add fruiting landscape plants for birds. A serviceberry, with its all-season interest is a great plant, but such a bush is really too big for small yards. The same holds true for trees such as mountain ash, red cedar, or crabapple. 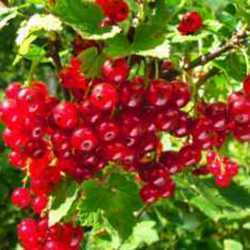 Smaller bushes like currants and gooseberries are a delight to the birds, but not as popular with humans. Raspberries take up a good deal of room and thorned varieties can be difficult to harvest. Blueberry bushes (Vaccinium genus) are a perfect plant for small spaces. Many bushes are vigorous growers with multi-season interest, yet are half the size of a serviceberry. 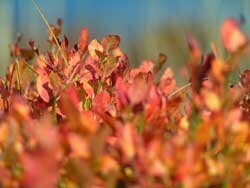 Spring flowering, many blueberry cultivars have beautiful fall foliage. Of course, birds and humans alike prize their mid-summer, nutrient-rich fruit. Unless you live in areas with ideal soil conditions — acidic and moist but well-drained — blueberry bushes can be difficult to grow. The solution? Container-grown blueberries. Some blueberry varieties, including dwarfs are reportedly easy to grow in containers because of their shallow root systems and compact nature. A container makes managing acidic soil conditions easy. Container-grown plants are also versatile; although heavy, they can be moved from spot to spot to find the ideal growing and visual location without disturbing the plant. Containers — Choose a container that is sturdy and will last for many years; a happy blueberry bush can live for a long time. It is important to ensure that the container drains well, but holds moisture. Container size should match your plant size. Larger varieties need more space. Half wine or whiskey barrels are good choices as are wooden tree containers. Dwarf varieties can be planted in a smaller five-gallon type containers. 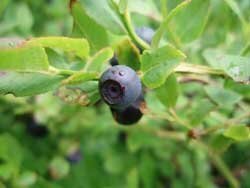 Soil — Blueberries like a low pH, or acidic soil. The ideal pH range for blueberries is 4.0 to 5.0. To determine the pH, you'll need to regularly test the soil in your container. Inexpensive home test kits are found at garden centers and make it easy to test the soil. Also available are soil testing meters. You may also contact your local University extension office to see if they offer soil testing. Unless you can find a rhododendron/azalea mix at your local garden center, you will have to make your own acidic mix. Planting — Ensure your container has proper drainage, including holes and drainage material (an inch of gravel in the bottom). Fill the container half way or so with your acidic soil mix (pre-mixed and tested). Determine how much more fill to place in the bottom of the container based on the root ball on the blueberry plant. The crown of the bush should be slightly above the soil line. Place the bush in the middle of the container and add more of your soil mix to the pot. Mulch lightly (2 to 4 inches) with bark mulch, saw dust or grass clippings. Water — Blueberries like lots of moisture, but don't like to be water logged. This means it's important to not let your plants dry out. If you have a very warm climate, many days of dryness, or a small container this may mean watering every day. Yards equipped with irrigation systems can be adjusted to cover the blueberry container. If you are planning on watering with tap water, you may wish to contact your city water department for pH information, or test the water pH. Tap water often contains lime, and blueberries don't like lime. Most places that sell aquarium supplies should carry water pH test kits. If you have the option, water with rain water. 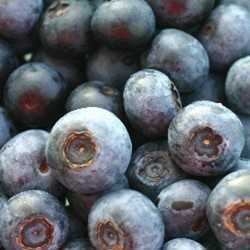 Light — When it comes to good blueberry production, the more sun the better. Choose a sunny location with at least six hours of sun a day. Pollination — Not all blueberries are self-pollinating. For best results, plant two varieties and encourage bees in your area. Winter protection — Gardeners in northern climates need to take extra steps to protect their plant in the winter. To increase humidity and reduce branch loss, wrap the plant above the container in burlap. Begin by driving three stakes into the pot in a triangular fashion; wrap the plant using the stakes as guides and secure. Take the time to also protect the container itself. Remember that the roots are not in the ground, so do not have extra insulation. This is not a problem if you have several inches of snow, but in cold and dry winters, damage can occur. Place straw bales around the container or wrap in blankets or other insulating material. If you've always wanted to grow blueberries but haven't had luck or the soil conditions, give container blueberries a try. While bushes take three to five years to mature, the results will be well worth the wait. Once you start to see fruit, be prepared to fight the birds for the bounty! Whether you are in a northern or southern climate, choose a variety is a zone or two hardier than your location. This will ensure that the plant can survive the winter conditions in your yard. Here is a list of recommended cultivars for both areas. 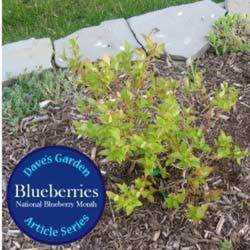 Northern gardens — Short or dwarf varieties of highbush blueberries do well in containers. Southern gardens — Southern highbush or rabbiteye blueberries need less chill hours than their northern counterparts. Sunshine Blue is highly recommended for southern areas, though there are a few other varieties recommended. Have you grown blueberries in containers? If so, give us your advice by submitting your input below! 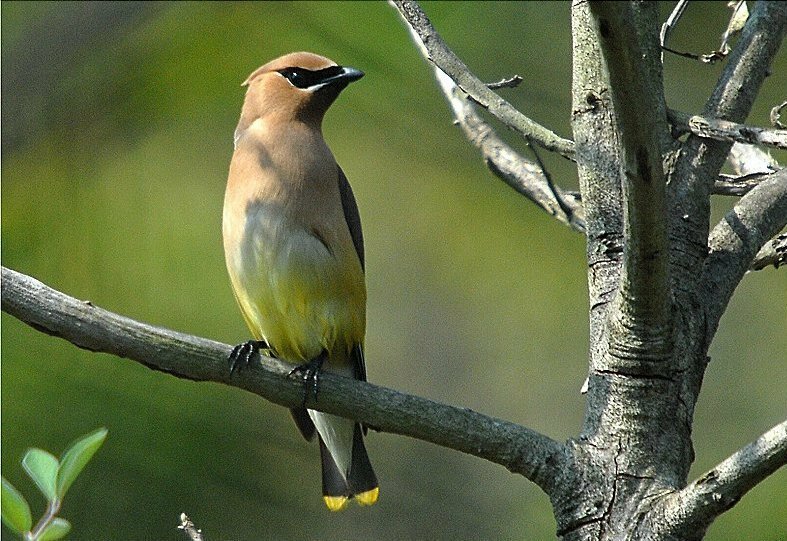 Thanks to Dave's Garden member "linthicum" for his Cedar Waxwing image in BirdFiles.